The Aurora area is home to an impressive collection of architecture, including structures by Frank Lloyd Wright, Ludwig Mies van der Rohe, Bruce Goff and George Grant Elmslie. The Hollywood Casino Aurora, a dockside gaming facility with 53,000 square feet (4,900 m2) and 1,200 gaming positions, is on the river in downtown Aurora. Aurora is also home to a large collection of Sears Catalog Homes (over 50 homes) and Lustron all-steel homes (seven homes). 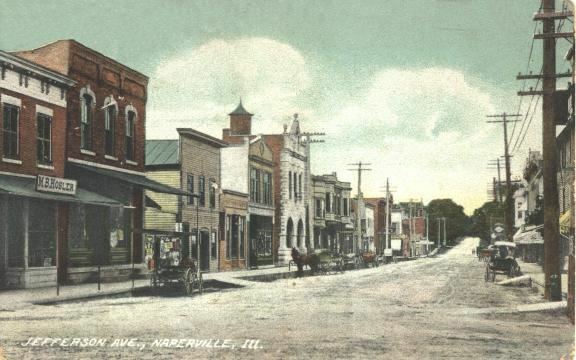 Aurora was originally two villages: East Aurora, incorporated in 1845, on the east side of the river, and West Aurora, formally organized on the west side of the river in 1854. In 1857, the two towns joined officially, incorporated as the city of Aurora. The two sides could not agree which side of the river should house the public buildings, so most public buildings were built on or around Stolp Island in the middle of the Fox River. As the city grew, many factories and jobs came to Aurora. In 1856, the Chicago, Burlington and Quincy Railroad located its roundhouse and locomotive shop in Aurora to become the town's largest employer until the 1960s. The heavy industries on the East side provided employment for generations of European immigrants. Immigrants flocked to the city, mainly from Great Britain, Ireland, Scandinavia, Luxembourg, Germany, France, and Italy. 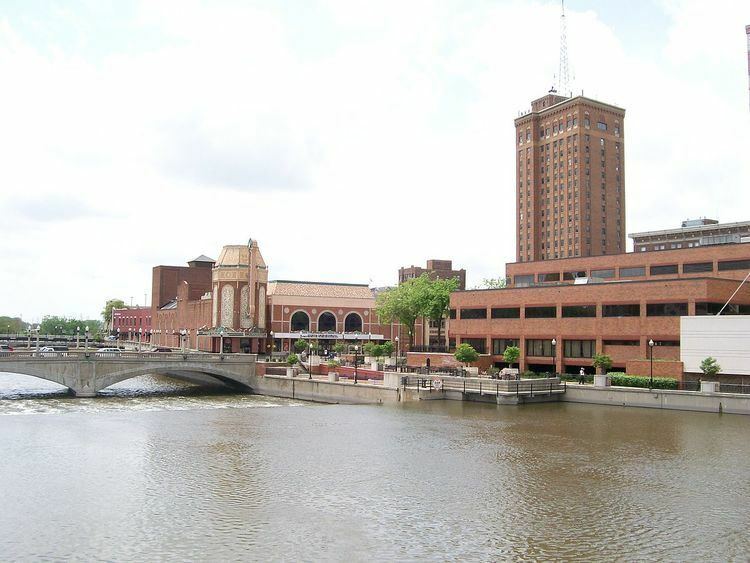 Aurora became the economic center of the Fox Valley region. The combination of these three factors—a highly industrialized town, a sizable river that divided it, and the Burlington's shops—accounted for much of the dynamics of Aurora's political, economic, and social history. The city welcomed a variety of immigrants and openly supported abolitionism before the American Civil War. Mexican migrants began arriving after the Mexican Revolution of 1910. Socially, the town was progressive in its attitude toward education, religion, welfare, and women. The first free public school district in Illinois was established in 1851 and a high school for girls came four years later. The city was a manufacturing powerhouse until the early 1970s, when the railroad shops closed. Soon many other factories and industrial areas relocated or went out of business. By 1980, there were few industrial areas operating in the city, and unemployment soared to 16%. During the late 1970s and early 1980s, development of the Far East side along the Eola Road and Route 59 areas began. While this was financially beneficial to the city, it also contributed to the decline of the downtown and the manufacturing sectors on the near East and West Sides. Crime rates soared and street gangs started to form in the mid-1980s. It was during this time Aurora became a much more culturally diverse city. The Latino population started to grow rapidly in the city in the 1980s. In the late 1980s, several business and industrial parks were established on the city's outskirts. In 1993, the Hollywood Casino was built downtown, which helped bring the first redevelopment to the downtown area in nearly twenty years. In the late 1990s, more development began in the rural areas and towns outside of Aurora. Subdivisions sprouted up around the city, and Aurora's population soared. Aurora is at 41°45′50″N 88°17′24″W (41.7637855, -88.2901352). The annual precipitation for Aurora is about 40 inches. The record high for Aurora is 111 °F (44 °C), on July 14, 1936. The record low is −33 °F (−36 °C), on January 16, 2009. The average high temperature for Aurora in July is 83.5 °F (28.6 °C), the average January low is 12.6 °F (−10.8 °C). There were 46,489 households out of which 44.2% had children under the age of 18 living with them, 56.5% were married couples living together, 12.0% had a female householder with no husband present, and 26.4% were non-families. 20.6% of all households were made up of individuals and 5.3% had someone living alone who was 65 years of age or older. The average household size was 3.04 and the average family size was 3.55. Downtown Aurora is home to the Paramount Theatre, a large live performance theater on the National Register of Historic Places, and the Hollywood Casino. There is also the Leland Tower, a former hotel which was the tallest building in Illinois outside of Chicago and is on the National Register of Historic Places. The largest collection of commercial buildings by Prairie School architect George Grant Elmslie is here as is the main building of Aurora Public Library and a branch campus of Waubonsee Community College. Downtown Alive, a festival that includes live music and a variety of food booths, is held on three weekends (Friday and Saturday night) in the summer; Blues on the Fox (featuring national blues artists) is held on the Friday and Saturday of Father's Day weekend. Roughly 8,000–13,000 people attend. The quarterly AuroraArtWalk is hosted by the Cultural Creatives—a grassroots team of local artist, property owners, patrons and the City of Aurora. The Riverfront Playhouse is a not-for-profit theater that has held a storefront location in downtown Aurora since 1978. A fixture of Downtown Aurora, the Waubonsee Community College Campus, which formerly sat on Stolp Island near the Paramount Theatre, has recently closed, as a new and greatly expanded campus was built on the Western banks of the river, between the river and IL Route 31. The construction of the campus was part of a larger plan to redevelop the Downtown area, putting in parks and new walking paths, making the area more inviting. The plan also included a pedestrian bridge, which would connect the one banks of the river. Also in the works is a plan to modify or reconstruct the bridges onto Stolp Island, which have not been maintained for nearly 60 years. Wayne's World (1992) is a buddy film explicitly set in Aurora. The characters emerged from the television show Saturday Night Live; one of the original authors of the skit was from neighboring Naperville, Illinois and thought Aurora had the appropriate blue-collar feel desired for the characters. Though most of the movie was filmed elsewhere, there are at least one or two bits filmed on location in Aurora, most notably the scene in which a White Castle is shown. Its sequel, Wayne's World 2, is also set in Aurora. Aurora was once home to the Aurora Islanders/Blues/Foxes, a minor league baseball franchise that played from 1910 to 1915 in the Illinois-Wisconsin League. Their most famous player was Casey Stengel, who played one season with the team before being bought by the Brooklyn Dodgers. Stengel batted .352 and was the batting champion of the league for 1911, and also led the league with 50 stolen bases and had 27 outfield assists. The team played in a stadium on the west side in the former Riverview Park. Waubonsie Valley High School (IPSD—District 204) Soccer won the Northern Illinois regional championship in this highly competitive region, for both boys and girls, almost every year since 1987. In 2007, the Waubonsie Valley High School girls' team won the state championship and went on to achieve the #1 ranking of all high school girls' soccer teams in the United States, finishing with an undefeated season. Aurora has numerous youth soccer clubs, most of which have teams represented in the top five percent of the Northern Illinois Soccer League. Several youth soccer players from Aurora have received college scholarships to major college soccer programs throughout the U.S. In addition, Aurora maintains several developmental advantages for soccer enthusiasts. Three high quality indoor soccer venues allow year-round soccer training and competition for children and adults. Additionally, several area traveling soccer clubs, as well as high schools, boast coaches and trainers who have played soccer professionally or have been starting players for national teams. Some even played for teams that won the World Cup. Supplementing the local soccer training regimen are professional soccer trainers from England, Brazil, The Netherlands, Scotland, and other countries. Several played in the Premier League and for the Brazil national team, and for the Argentina national team. Due to the city's size, these are not the only three school systems serving residents - some students in the far north end of the city (north of I88 in Kane County) attend Batavia public schools, some on the far southwest side attend Kaneland CUSD 302 schools (headquartered in Maple Park), and some students in the far south end of the city (a small corner of the Kane, Kendall and Will County portions) attend Oswego public schools. Four of the schools in Oswego CUSD 308, Wheatlands Elementary, Homestead Elementary, Wolf's Crossing Elementary, and Bednarcik Junior High are within Aurora's limits. Aurora is also home to other private schools. Within Aurora, there are three Roman Catholic High Schools, Aurora Central Catholic (Diocese of Rockford), Rosary, and Marmion Academy (Order of St. Benedict), and seven Catholic elementary schools operated by the Diocese of Rockford. Along with these three schools is Aurora Christian High School and Elementary School. Aurora is also home to Fox Valley Montessori School, one of the first Montessori schools established in Illinois in 1969, which offers a preschool and elementary program. The Beacon News is Aurora's oldest business, first published in 1846, and is part of the Chicago Tribune Media Group. The newspaper has two editions: the Aurora edition and the Kendall County edition. The Beacon-News has been recognized repeatedly by the Associated Press, Illinois Press Association, Northern Illinois Newspaper Association and the Chicago Headline Club as one of the best daily newspapers in Illinois. In 2008, reported major crimes in Aurora were at their lowest level in nearly three decades. The Chief of Police attributed the drop to a number of factors but especially credited the hard work of the city's police officers and the increase in anti-gang priorities. Gang violence had reached a high in the 1990s, with the city averaging nearly 30 murders per year. In 2008, Aurora only had 2 murders. In July 2007, the Aurora Police Department and the FBI conducted "Operation First Degree Burn," a sweep that resulted in the successful arrest of 31 alleged Latin Kings gang members suspected of 22 murders dating back to the mid-1990s. Aurora has also adopted programs such as CeaseFire to reduce gang violence and prevent youths from joining gangs. Aurora had no murders in 2012.